Between 2001 and 2006, Elvis Costello contributed extensive liner notes to the deluxe reissues of his first 17 albums, totalling more than 60,000 words. The US magazine Slate pointed out that EC’s text was longer than The Great Gatsby, but they might just have as easily referenced Farenheit 451, Lord Of The Flies or Slaughterhouse Five. A sneaky move, perhaps? Was Elvis’s underlying message: “Yes, you can read my autobiography, as long as you buy 34 compact discs”? He’s been teasing fans with the prospect of a tell-all tome for a while now, turning up on TV talk shows and playing his old pal and producer Nick Lowe’s song ‘When I Write The Book’. 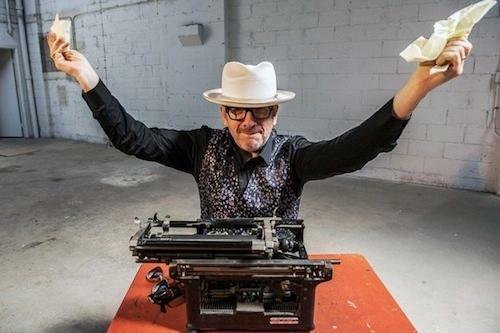 Many Costello biographies have been published over the years, the vast majority of them fumbling cut-and-paste jobs that failed to get anywhere even remotely close to the true heart of one of popular music’s most intriguing and contrary figures. Graeme Thomson’s Complicated Shadows (Canongate, 2004) is the exception, and nigh on essential in terms of an outsider perspective, but ultimately the job was one that would have to be done by the man himself. And here it is. Unfaithful Music & Disappearing Ink (Penguin Viking) is, without doubt, one of the greatest self-penned appraisals of a popular entertainer’s life and work. It’s a scattergun narrative, leaping back and forth in time, but each remembrance, each assessment of people and places, each argument, each confession is presented in evocative, eloquent prose that mirrors the poetry of Costello’s own lyrics. 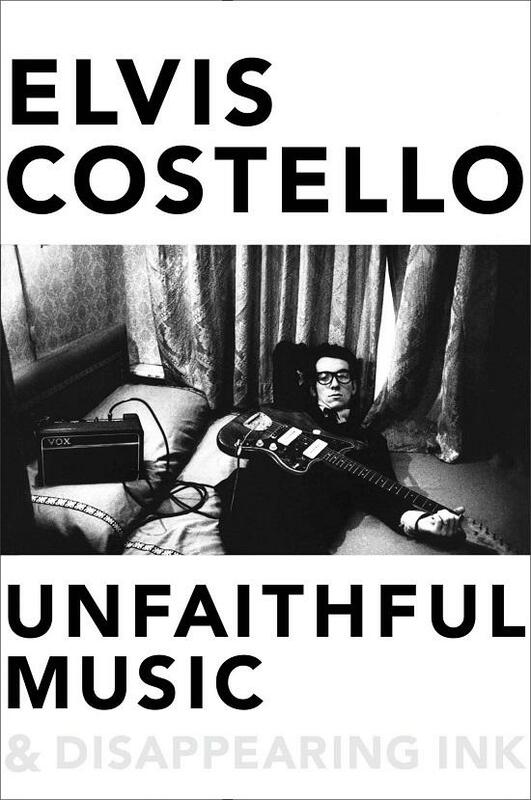 You’ll discover fresh insights into the 300-plus songs he’s written and taken to market, you’ll be amused by his interactions with others (hungover breakfasts with Van Morrison, incurring the wrath of June Carter Cash, fan boy fear when sharing a stage with Roy Orbison), but it’s beyond the concerns of the day job that Costello writes with such grace and passion and (occasionally) rage. His father, jazz trumpeter and singer Ross MacManus, looms large; from childhood trips to the Hammersmith Palais watching dad with the Joe Loss Orchestra, to afternoons at home listening to sixties hit parade songs the elder man had to learn for radio broadcasts, and – most heartbreakingly – Ross’s last years when dementia all but wiped his own memories of the past. Chapters about the MacManus clan afford Elvis the opportunity to delve deep into not just his family history, but the pre- and post-war experiences of the working class in London and Liverpool. It’s here where Costello proves himself to be an admirably articulate social chronicler, with an eye for detail and an unerring knack for placing his extended family’s past into context with his own career’s trajectory. Similarly, when he writes about making an album with New Orleans legend Allen Toussaint in the wake of Hurricane Katrina, it’s prefixed with an astonishing passage of reportage, cataloguing his own visit to the devastated city, its hope and determination bubbling up from the filth and detritus of the flood waters. There’s loads of stuff about his songs, about making albums that people either adored or dismissed, but most of that was covered in those aforementioned liner notes. What makes this book a classic (yes, you heard me) is the beauty of the writing, the seemingly effortless imagery of situations, saints and sinners (EC puts himself in the latter category, often), and the persuasive nature of the text that should make even the most casual reader clamour for more after 670 pages. Don’t start him talking, he could talk all night. On this evidence, it’d be worth listening to him talk every night for the next couple of years. I was the first songwriter through the door after reading an announcement that Stiff Records was open for business. I called in a sick day for my computer job and rode the Tube to a single shop front building in Westbourne Park. I’d been to record company premises and publisher’s offices before, but this didn’t seem like any operation I’d ever encountered. There was only one person looking after the store, a delightfully well-spoken young woman with a hennaed Mia Farrow haircut. She had been left alone manning the phones but had a slightly scattered air. I half expected her to sell me a scented candle. She seemed surprised that any potential recording artists might be knocking on the door so soon, and I left my home recorded demo tape with the assurances it would be auditioned and returned to me. I walked back to the Tube station and, with all the improbability of the movie version of our lives, walked straight into Nick Lowe, who must have been arriving to the Stiff offices in his capacity as their sole artist and potential house producer. Nick said, “Are you going to tread the planks again any time soon, old chap?” and we stood there for a moment like two old vaudevillians chatting at the stage door of the local music hall. I bade Nick farewell and went on my way, not knowing whether I would see him so often, now that his band had broken up. I already knew one of the Stiff bosses, Dave Robinson. He had managed Nick in Brinsley Schwarz and once roadied for Jimi Hendrix and had the pictures to prove it. He was an Irishman who looked like he might be a good judge of a horse. In 1975, when Dave was tinkering with the equipment at the studio he’d installed above the Hope and Anchor public house in Islington, he offered me the chance to come in and make some solo recordings while he twiddled the dials. I would get a demo reel out of the deal. I cut every song that I’d written that year, about twenty-five of them in total. Not one of them ever saw the light of day. The control booth contained an 8-track board that had belonged to Eddy Grant of The Equals, although only seven tracks ever worked. The word went around that Dave had written to Al Green’s producer, Willie Mitchell, for the floor plan at Royal Studios in Memphis, asking where Willie located his drum booth and positioned his microphones, allegedly receiving a pretty detailed reply, although I never saw the blueprints with my own eyes. Dave then hatched a scheme to record Flip City for a one-off single of “Third Rate Romance,” a song I’d learned from a Jesse Winchester record, but the plan ran out of money and time, as the band disintegrated when we found out that we couldn’t play like the Hodges Brothers. However, the experience of being in the studio was both educational and a little death defying. The recording gear was set in a function room at the top of a flight of stairs where the pub had previously held wedding receptions, but there was nothing to stop the two tons of equipment from crashing down on the patrons in the bar below and even into the music venue in the basement. At least “Unpromising Young Band Slays Audience” would have made an interesting headline.